This book review was first published in Physics World. The Weeknd at the Grammys. The press coverage of this year’s Grammy awards taught me a new term: “producer inflation”. The term refers to the way making hit records seems to require bigger collaborations now than it did in years past, when teams of one or two producers sufficed to create all of the tracks. Pop star Taylor Swift’s latest Grammy-winning album, for example, boasted no fewer than 11 producers, while another hit album, by an artist called The Weeknd, listed 15. The trend towards large collaborations is apparent in science, too. A paper with more than 5000 authors appeared last year in Physical Review Letters (2015 G Aad et al. (ATLAS Collaboration, CMS Collaboration) 114 191803), while the paper announcing the recent discovery of gravitational waves had more than 1000. 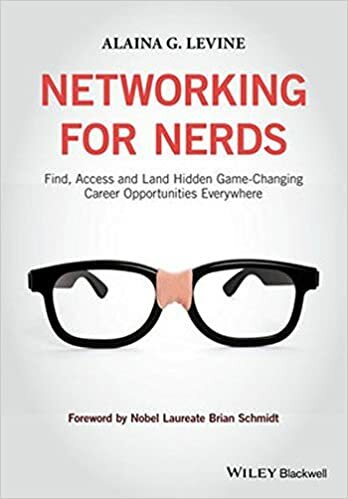 This development, along with a perennial hunger for career advice among young scientists, has set the stage for Alaina Levine’s book Networking for Nerds: Find, Access and Land Hidden Game-Changing Career Opportunities Everywhere. Networking for Nerds aims to teach you how to build relationships within this large pool of potential colleagues, mentors and collaborators via conferences, job interviews and online networking. As well as offering a dizzying array of networking dos and don’ts, the book takes readers on a tour of useful concepts and strategies such as branding, SWOT analysis (strengths, weaknesses, opportunities and threats), etiquette and social media. This is all standard stuff in some circles, particularly the business world, but it’s material that most scientists neglect during their education. The tips in the book include intriguing insights about when it’s appropriate to put your photograph on a business card (answer: it’s expected if you’re a realtor, but not if you’re a physicist), and even where you should place your knife and fork on your plate when you are done eating a formal meal (answer: in the US, they go at the 3 o’clock position; in Europe, at the 6 o’clock position). Here I must disclose that, thanks in part to Levine’s own prodigious networking skills, I came to know her long before reading her book. For years, she’s been an active participant in the “Marketing for Scientists” group I founded on Facebook. So, as Levine’s valued professional contact, I take some pride in recommending her work to you. Indeed, the book explains exactly why professional contacts generally enjoy recommending one another. There’s nothing wrong with this sharing of information – so keep reading. Levine understands us nerds because she has a bachelor’s degree in mathematics from the University of Arizona. She is also a science writer and a comedian. You should not, however, expect much comedy in Networking for Nerds. The tone is rather dry, despite the picture of goofy eyeglasses on the front cover. Bulleted lists of key points abound, and each chapter ends in a list of “Chapter Takeaways”. This textbook style is, perhaps, the book’s main limitation. While most readers of a book like this are probably not seeking a literary experience, while I was reading I found myself hungry for more narrative and a broader range of perspectives. Stories from nerds in various fields and from other career advice experts would have helped illustrate how the book’s techniques can apply across the diverse spectrum of scientific and academic subcultures. The prose provides many brief stories of Levine’s personal networking successes, but few stories of her failures that would help readers connect with her. 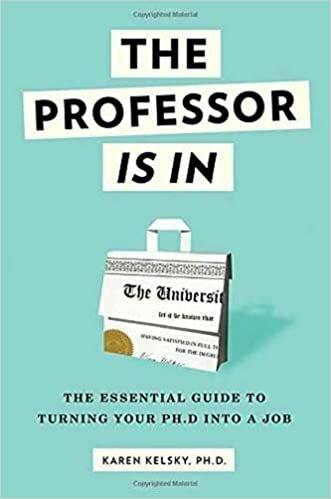 For a career advice book that’s easier to read and more comprehensive (at least for those aiming to stay in academia), try The Professor Is In: the Essential Guide To Turning Your PhD Into a Job. The author, Karen Kelsky, has a PhD in cultural anthropology from the University of Hawaii and rose to the rank of associate professor at the University of Illinois at Urbana-Champaign, serving for a while as the head of the Department of East Asian Languages and Cultures. If you think physics jobs in academia are rare, try getting a faculty position in an East Asian languages and cultures department! The odds are about the same as becoming an astronaut. The Professor Is In takes on the “peon” mentality that holds back so many graduate students and explains how to think differently in order to succeed. Kelsky plays the academic curmudgeon, overworked and too busy to be bothered with your simpering – thank goodness she’s on your side. Don’t read this book to pick up new social-media tricks, or learn how to sniff out hidden opportunities such as unadvertised STEM jobs. But if you expect to walk right through the front door of academia, you’ll need Kelsky’s advice on putting together your application packages, writing your essays and keeping your hopes realistic. As a mentor of students and postdocs, I expect I’ll find both of these books useful additions to my library. I’ll hand Networking for Nerds to the shy first-year graduate student to help them break out of their shell when they go to their first science conference. The fourth-year student who is starting to peer sideways at those faculty job listings will get The Professor Is In. But whichever book you find yourself handing your students, you might want to temper it with a bit of encouragement, because all this advice can get onerous. Ultimately, my favourite moment in these books came in chapter two of Networking for Nerds, where Levine acts on her sympathy for the beleaguered junior researcher by delivering, in a few words, a much-needed confidence boost. “You are a lot more important than you might have thought,” she writes, like a coach cheering a prize-fighter mid-bout. She’s correct. As a trained scientist or engineer, you are vastly important to the very future of humankind, wherever you end up working. And whether you’re wandering a vast, crowded conference room, or placing your CV on a huge pile of applications, your future rests on a strong belief in yourself. The best advice quote I’ve come across recently, useful in all areas of marketing and in improving the world too: “True wisdom gets angry at nothing.” (from the “Maxims” of La Rochefoucauld) Keep up the great work, Marc!